oh, sweet joy! : did you know...? that if you have a netflix subscription you can view workout videos from your computer? i didn't know this until i read it in real simple this weekend. pretty cool. this is the one i've been doing. i'll admit that i'm a bit prideful about exercise, and i thought 10 minutes? that won't do anything... so i did the entire video (though she says not to), which is five separate ten minute workouts. i'm having a bit of a hard time going up the stairs. however, nothing motivates me more than a work out instructor whose abs look like she is a teenage mutant ninja turtle. also, have you seen these? 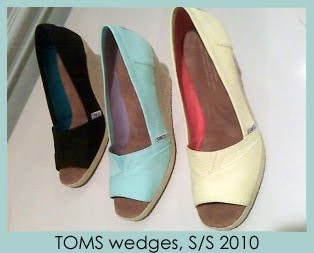 toms wedges! and peep toe...my favorite! i wanted them for my birthday (ahem. march 28th, people), but they don't come out until summer. those robins egg blue ones were made for me.